Made with fresh veggies and mango, these rolls taste as good as they look. Slice 3-4 lettuce leaves, avocado, red pepper and mango into short thin strips. 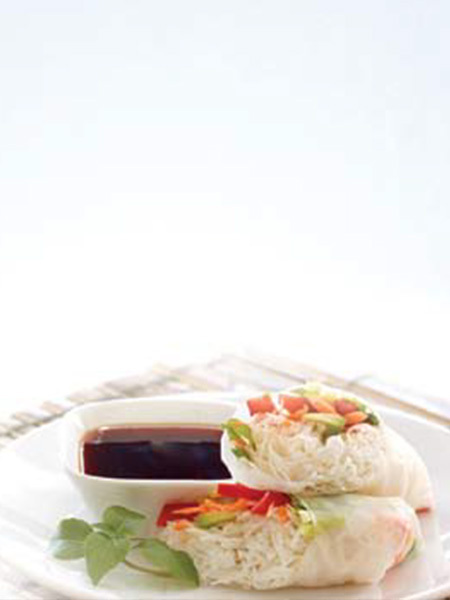 Follow preparation instructions on package of vermicelli noodles. Cook approximately ¼ package of noodles to start so that you won’t have any waste. Soak rice paper in hot water until soft enough to roll. Starting from the centre of the rice paper place from top of the paper to the bottom of the paper one line of lettuce. Beside the lettuce place one line of vermicelli noodles, then one line of avocado, beside it place a line of red pepper, then a line of mango and finally place a line of shredded carrot. Roll the rice paper like a tortilla wrap and fold in ends. Cut the spring roll into 3 inch pieces on the diagonal. Repeat steps 3-6 with each rice paper. Once completed serve with Teriyaki Experience Sweet Chili Sauce.